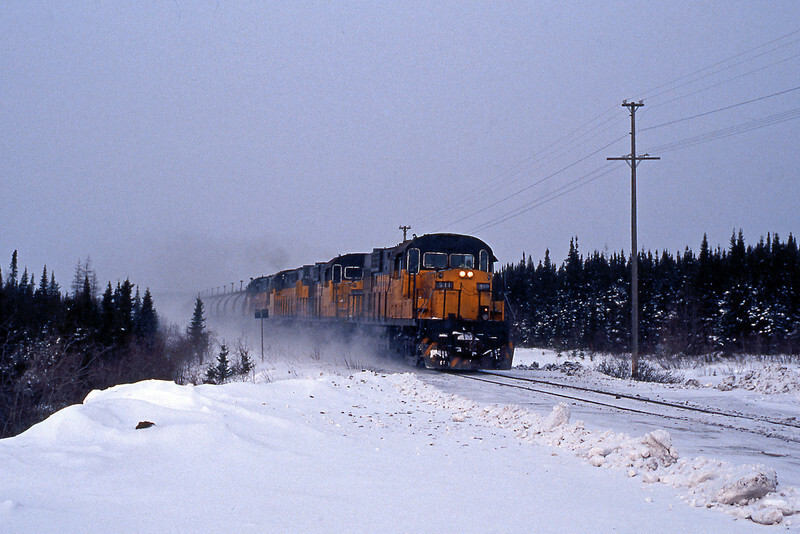 Along with the Iron Ore Company of Canada the US mining company, Cleveland Cliffs, has a mine at Wabush, served by their own shortline railroad, the Wabush Lake Railroad. The WLRR has trackage rights to Ross Bay Junction from where the QNS&L haul the train to a connection with the St Arnaud RR, just north of Sept Iles, which carries the ore to the Pointe Noire ore dock. The sole motive power of both the SARR and the WLRR are MLW RS18s bought new in 1963. Here is the entire fleet of the Wabush Lake RR passing the 8km crossing on empties picked from the QNS&L at Ross Bay.